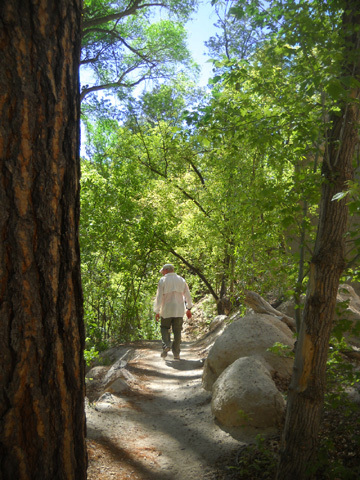 both short and long, invites you to explore the park . 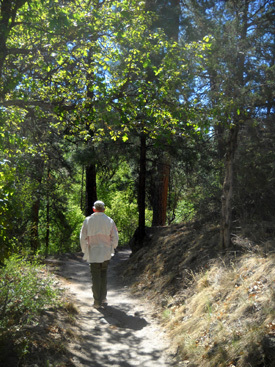 . ."
Since the weather was nearly perfect this morning, we drove down to Bandelier to hike one of the scenic trails that is new to us. Although we read about most of the trails on the park website, we weren't sure which one we'd hike today until we talked with a ranger in the visitor center after we got there. She highly recommended the Falls Trail to us for various reasons. It was a good choice. 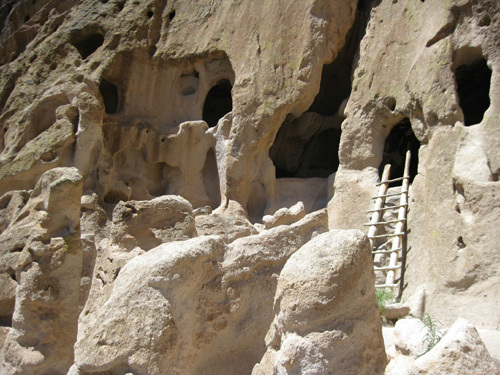 In a previous trip to Bandelier we hiked two of the heavily visited trails around the cliff dwellings. 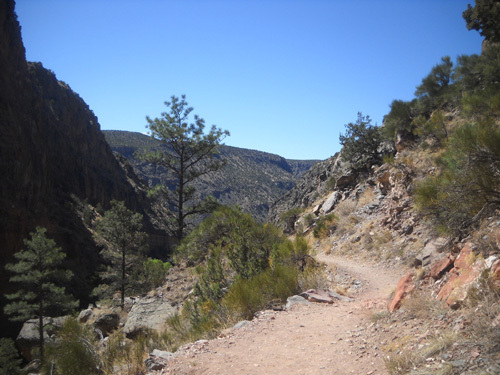 Those trails focus on archeological sites inhabited by Ancestral Pueblo people descended from hunters and gatherers who came into the region over 10,000 years ago. 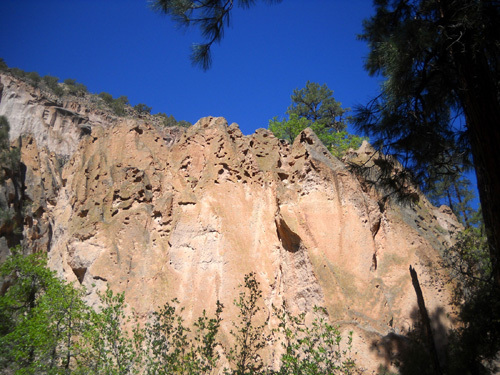 The trails to the cliff dwellings are very interesting -- and something every visitor to Bandelier should see at least once -- but today we wanted something more challenging and farther from the madding crowd. On the Falls Trail we saw only ten people in our 2�-hour hike from the Visitor Center down to the Rio Grande and back up. FALLING, FALLING . . . 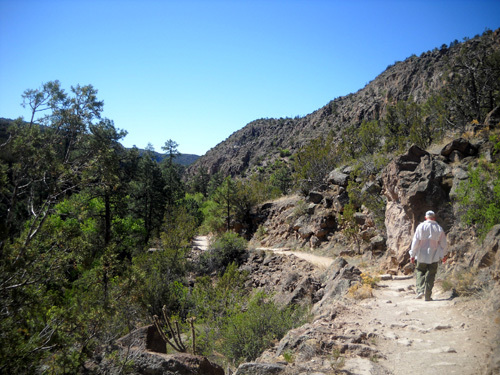 The Falls Trail descends 700 feet in 2� miles through Frijoles Canyon from the Visitor Center to the Rio Grande. 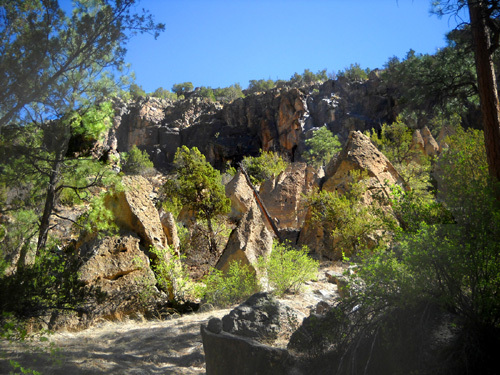 It passes two waterfalls (Upper and Lower) and crosses Frijoles Creek several times. 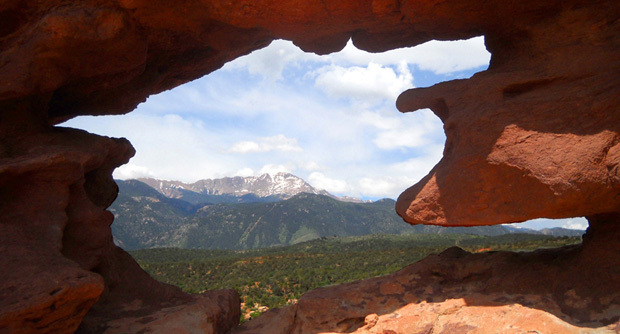 The round-trip hike is about five miles. 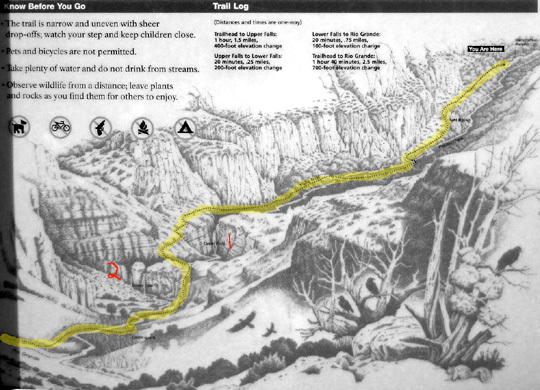 I highlighted the trail in yellow and marked the upper (1) and lower falls (2) in red. 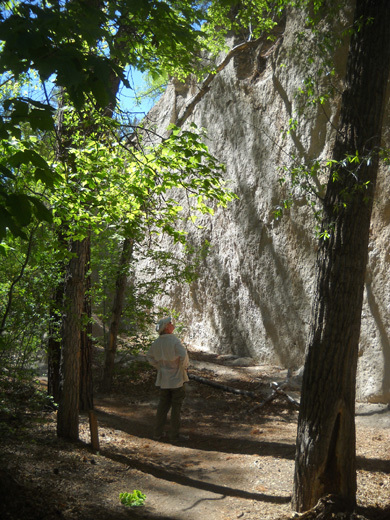 You can see a .pdf map of the park and the location of trails on any page on the Bandelier website. Just click the little box near the top that says "View Map." 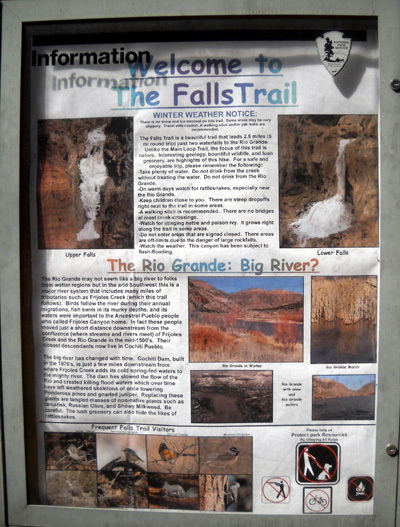 I recommend purchasing the inexpensive guide to Falls Trail at the visitor center the first time you hike this trail. It contains information about the native plants, animals, and interesting geology that will enhance your enjoyment of the hike -- identification of the various colorful rocks, including "tent rocks," that you'll see, how the rock layers and shapes were formed over the millennia, descriptions of the various eco-systems along the way and the wide variety of animals and plants that thrive in those environments, the effects of fires and floods, the history of the river, and more. 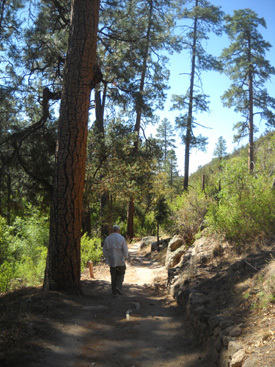 The photos that follow are in order going down the trail to the river and coming back up to the visitor center. Note: Since dogs aren't allowed on any of the trails at Bandelier (and many other national parks) we left Cody at home in the camper. Bikes aren't allowed, either -- just foot traffic. 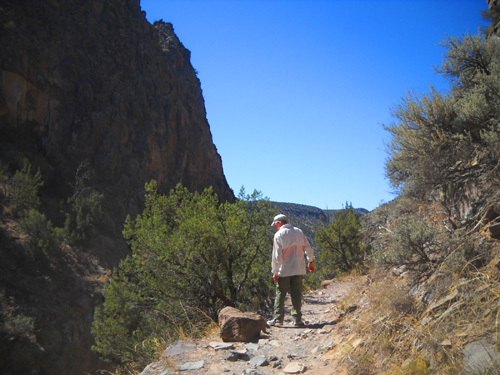 The Falls Trail is very scenic and varied. 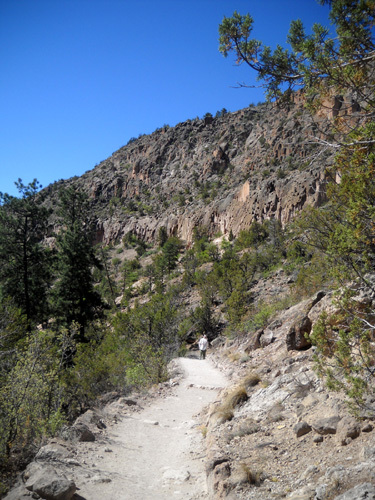 It's moderately easy to hike or run. 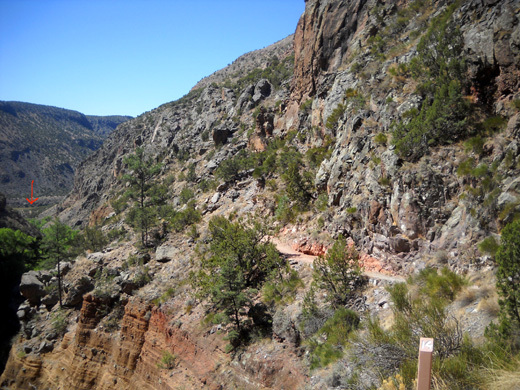 The descent to the river is mostly gradual with no steep grades; switchbacks are used when the trail drops significantly near the falls. There are a few rock steps to climb in that area, too. 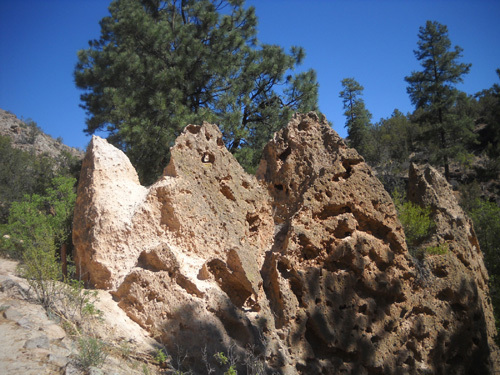 Surfaces range from soft and sandy to uneven and rocky. 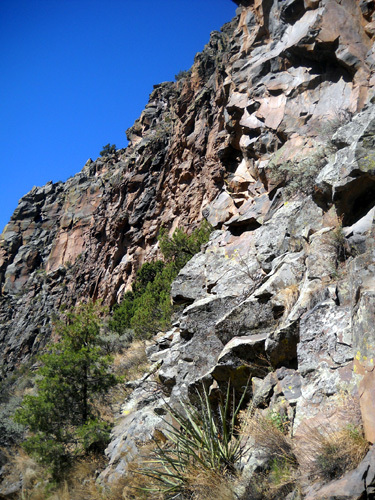 Frijoles Creek flows through the canyon down to the Rio Grande. The creek is narrow but runs all year long. It was pretty shallow today. 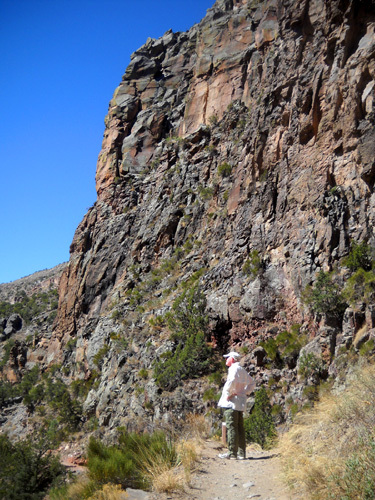 Jim inspects an almost-white rock wall. 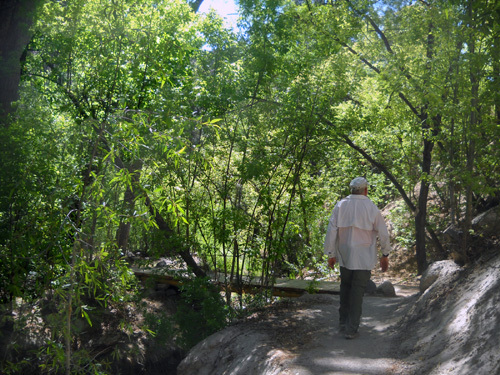 We crossed the creek several times on wooden foot bridges, then on rocks farther down where flash floods have washed out previous bridges. I'd estimate that about one-third of the trail is shaded and two-thirds is exposed. 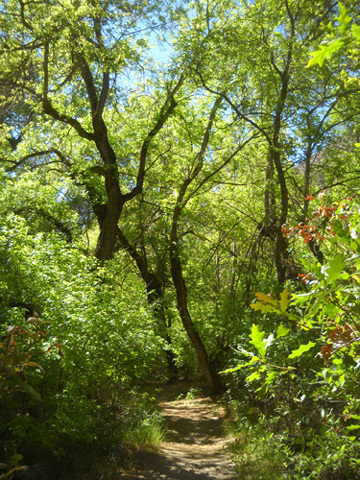 Treed and/or lush green areas are interspersed with rocky, exposed canyon areas all the way down to the river. 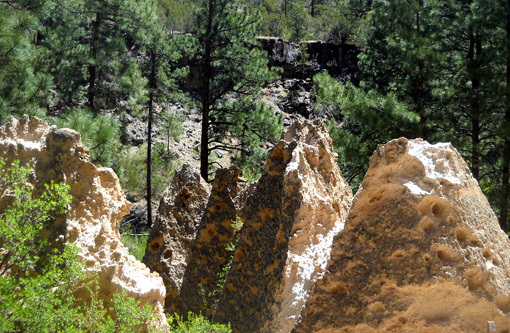 I really enjoyed the wide variety of colorful rocks and interesting rock formations. As you'll see, I took a lot of pictures of rocks! 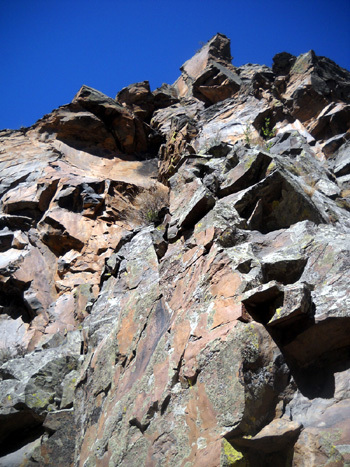 The darker rocks are hard, dense basalt. Jim looks into the canyon as the creek is farther and farther below us. Upper and lower falls continued on the next page . . .